Dr. Reichert's research interests have included biosensors, protein mediated cell adhesion, wound healing, and biocompatibilty. Dr. Reichert was the first member of the engineering faculty to receive the Clemson Award from the Society for Biomaterials (there have since been three others) and elected as a Fellow of the International Union of Societies for Biomaterials Science and Engineering and the American Council on Education. He was also elected as a Fellow of the American Institute of Medical and Biological Engineering and the Biomedical Engineering Society. Dr. Reichert also received recognition for his student mentoring, especially in the area of diversity. The drivers of his career were more than 30 years of uninterrupted NIH support from six different institutes, sustained support from the Medtronic Corporation, and the dedication and brilliance of numerous undergraduate, graduate, postdoc, staff and faculty colleagues. But life moves on. 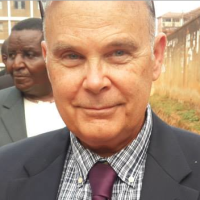 Dr. Reichert spent the 2014-15 academic year as a Fulbright Scholar (also a school of engineering first) in the fledgling BME program at Makerere University in Kampala, Uganda where he taught six classes in two semesters and conducted a major curriculum revision to increase engineering content. This exhilarating (and exhausting) experience transformed Dr. Reichert’s professional priorities from domestic biomedical research to building BME capacity at Makerere University and in Uganda. With generous funding from the Duke BME Department, Duke University Provost’s Office, the Duke Global Health Institute, the Pratt School of Engineering, and the Duke Africa Initiative, Dr. Reichert launched the Duke-Makerere BME Partnership to accelerate the development of biomedical engineering in Uganda. The Partnership consists of three components. Undergraduate Education. Currently there are two initiatives. In the fall semester BME525 Biomedical Materials and Artificial Organs is taught to both Duke and Makerere students by broadcasting lectures recorded at Duke to students in Uganda. The students take the same exams, are assigned the same readings, and conduct similar group projects. Real time interaction between the instructor and the Makerere students is accomplished by weekly Skype sessions. The Duke students are encouraged to incorporate some aspect of the Uganda circumstance in their projects. In the spring term Duke offers a class BME590 Transcontinental Design for Uganda where a limited number of Duke and Makerere students participate in mutual design activities to create solutions to healthcare issues in Uganda. This class also includes an option for the Duke students to travel to Uganda during their spring break to meet with and interact with their Makerere design partners. Travel scholarships are provided by the Partnership predicated on financial need. Master’s Education. Receiving a Master’s degree is a significant step in the professional development of aspiring academics and entrepreneurs In Uganda. Starting in August 2016 the Partnership will be bring two Ugandans with undergraduate BME degrees or a related field to Durham to join Duke BME Master’s Program. A key component of student selection is performance in BME525 and BME590. These students will spend the first two semesters taking BME classes at Duke and also defining their dissertation topics. During the following summer the students will transition back to Makerere for their third and final semester where they complete their dissertation work and possibly take a class. Dr. Reichert will travel to Uganda to join the Makerere faculty members for the dissertation defense, while the other Duke committee members will attend via Skype. All educational and living expenses will be paid by the Partnership except for living expenses while the students are back in Uganda. Doctoral Training. Unlike the Bachelor’s or Master’s degree, the PhD degree is an immersive research experience. Admission decisions to top science and engineering PhD programs are largely predicated upon evidence of a keen aptitude and substantial commitment to research. Making this determination with non-traditional candidates can be difficult, especially when in-person interviews are not possible. The Duke-Makerere BME Partnership provides an excellent opportunity for the Duke faculty to see the Uganda Master’s students up close and personal. The students that perform at a high level in their Duke classes and on their dissertation projects, and who are committed to pursuing the PhD, will be invited to apply to the Duke BME PhD program as a regular international student. Biosensors, protein mediated cell adhesion, and wound healing. Diaz Quiroz, JF; Rodriguez, PD; Erndt-Marino, JD; Guiza, V; Balouch, B; Graf, T; Reichert, WM; Russell, B; Höök, M; Hahn, MS, Collagen-Mimetic Proteins with Tunable Integrin Binding Sites for Vascular Graft Coatings, Acs Biomaterials Science & Engineering, vol 4 no. 8 (2018), pp. 2934-2942 [10.1021/acsbiomaterials.8b00070] [abs]. Ploss, B; Reichert, W, Part I. The Emergence of Degree-Granting Biomedical Engineering Programs in Sub-Saharan Africa., Annals of Biomedical Engineering, vol 45 no. 10 (2017), pp. 2265-2268 [10.1007/s10439-017-1897-2] [abs]. Munoz-Pinto, DJ; Erndt-Marino, JD; Becerra-Bayona, SM; Guiza-Arguello, VR; Samavedi, S; Malmut, S; Reichert, WM; Russell, B; Höök, M; Hahn, MS, Evaluation of late outgrowth endothelial progenitor cell and umbilical vein endothelial cell responses to thromboresistant collagen-mimetic hydrogels., Journal of Biomedical Materials Research. Part A, vol 105 no. 6 (2017), pp. 1712-1724 [10.1002/jbm.a.36045] [abs]. Fernandez, CE; Yen, RW; Perez, SM; Bedell, HW; Povsic, TJ; Reichert, WM; Truskey, GA, Human Vascular Microphysiological System for in vitro Drug Screening., Scientific Reports, vol 6 (2016) [10.1038/srep21579] [abs].